Following my previous post I set out this morning (Saturday) to see if I could locate the grave of the young man in question. Mont a L’Abbé Cemetery is a pretty big affair and it was more in hope than expectation that I wandered around the paths on a mild, still morning. But I love wandering around cemeteries – weird eh? I can’t be the only one but I don’t seem to bump into many others doing likewise. Names, surnames, dates of birth and death, other family members, maybe extra information about the deceased – I’m fascinated by it all. And the great and good, together with the ordinary citizen, all pretty much in the same boat and forgotten after a few years. 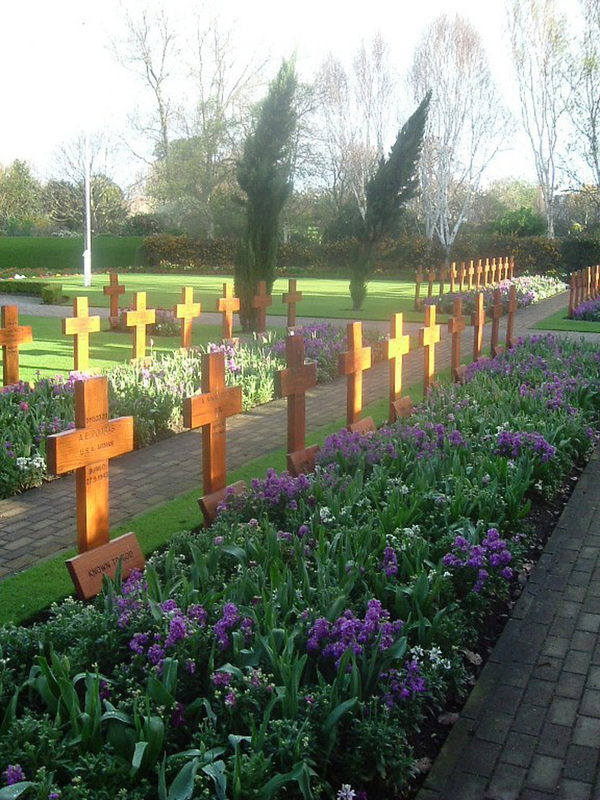 Few graves are tended and upkept in the long term with only the minimum maintenance carried out by caretakers. 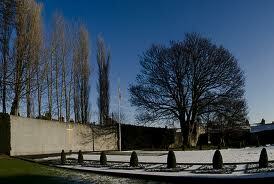 Glasnevin Cemetery in Dublin, Ireland is vast. You could spend weeks mooching around there. It was Dublin’s early 19c answer to the lack of space in the city churchyards. The lookout towers can still be seen – grave robbing was once a lucrative trade, but it became less so in Ireland as the Famine of the 1840s hit. And it is a hard heart that isn’t moved by the Angels’ Plot under which they estimate lie the bodies of some 50,000 babies, newborn or stillborn. Such were the expectations of the Irish people then. By contrast, the remains of the executed martyrs of the 1916 Revolution lie quietly in the old British barracks, now Arbour Hill Prison on Dublin’s northside. One time, whilst in Cork, I decided to visit the grave of the legendary Rory Gallagher. As usual I wanted to find it for myself without asking at the office or paying for the information. After the best part of three hours I’d just about given up and decided that Rory must have insisted on a very discrete burial. A caretaker, curious by this time and also wanting to lock up, asked me who I was looking for. On telling him he pointed to the entrance gates – ‘Out of here, turn left and drive four miles. You’re in the wrong place.’ I will one day. One thing about looking for graves is that they’re not going anywhere. Parish churchyards are fascinating, but so are the huge municipal places built to relieve overcrowding. 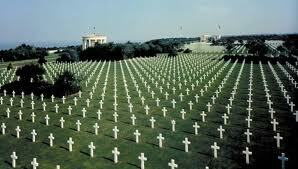 But completely different again are the war cemeteries of Normandy in France. Normandy is pretty bleak anyway but the serried ranks of crosses and stones, cared for meticulously in every case, stretching in mathematically precise lines as far as the eye can see paints a picture of how bleak it must have been for the hundreds of thousands ‘Known to God’. 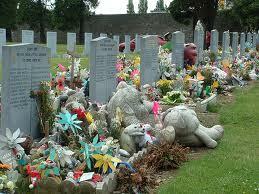 I blogged fairly recently about one of the more interesting Irish graveyards here. And here in Jersey, in Howard Davis Park, we have our own War Cemetery for sailors, both known and unknown, washed up here during WW2. So today, no I didn’t find what I was looking for. Maybe 50% of the graves are either unmarked or the inscriptions illegible. And I’d need to get off the marked paths and march amongst the graves themselves to see a lot of them. I’m never too keen to do that really. If all else fails I’ll need to get the people in charge to look it up for me, but that will be a last resort. But I did come across one or two interesting ones. The Allix family, of shipbuilding fame, CW Duret Aubin, Jersey’s Attorney General throughout the Occupation years, and the artist Philip John Ouless. As we drove home from football this morning we went past the cemetery, William suddenly shouted, “there’s Roy in the cemetery looking at the graves” its a small island, so it is. Well this isn’t necessarily writing-related Dianne. However there might be a niche waiting for a book about a dodgy guy who haunts graveyards – I hear teenage zombies are all the rage. I’m being encouraged to try some short stories Dianne. I’m reading yours right now. I’m gathering ideas about structure from you, but also wondering how I can ever begin to match your mastery of description, seamless knitting of violence into an everyday tale etc etc. The answer of course is to learn the lessons and craft one’s own style. Thanks for your encouragement as well Dianne. Have you got the version of the book that explains why I wrote all the stories? No, the Kindle version hasn’t got that.